Happy Holidays and Happy New Decade From Morbid Anatomy and Krampus! Hi All. 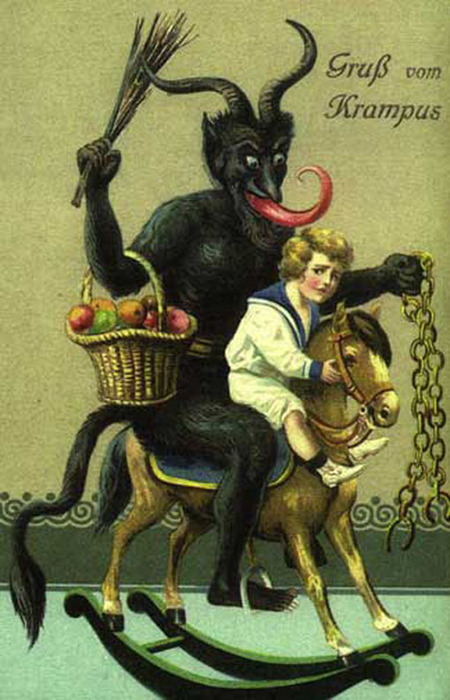 I will be essentially off-the-internet for much the holidays, and wanted to take this opportunity--before leaving behind my office and wi-fi for the wilds of Scranton, PA--to wish all of you all Happy Holidays and best wishes for the new decade, compliments of myself and Krampus, St. Nicholas' cloven-hooved, chain-swinging, lolling-toungued, child-punishing Eastern-European sidekick. For more on Krampus, see these recent posts (1, 2, 3). If what you see interests you, then you might want to check out The Devil in Design: The Krampus Postcards, which you can purchase from The Morbid Anatomy Bookstore by clicking here. If anyone has any tips on things not-to-be-missed in the Scranton, PA area, please (!!!) let me know by clicking here. Happy Holidays, and more to come in 2010! In a recent issue of the New York Review of Books (“Specters of a Chinese Master,” 12-3-2009: 16-18;), Jonathan Spence, the brilliant historian of China, reviews an exhibition of Luo Ping paintings at the Metropolitan Museum of Art in New York (on only until January 10, 2010). The review pleasurably narrates the life and career of Luo Ping (1733-1799), a fascinating story, and discusses his “ghost” paintings (and the genre of ghost painting, which he invented), especially his great scroll painting, Ghost Amusement (1797). A detail of Ghost Amuseument, reproduced in the article, shows an anatomically correct skeleton with a spear, a death figure which is also evidence of the diffusion of Vesalian anatomy into China. For those who can’t make the trip to MMA, there is also a printed catalogue of the exhibition, Eccentric Visions: The Worlds of Luo Ping (1733–1799) (Zurich: Museum Rietberg), edited by Kim Karlsson, Alfreda Murck, and Michele Matteini, $62.00. Scholars have not yet intensively studied the diffusion of the post-Vesalian anatomical body into China, India, Africa, the Islamic world, and the Americas, how it was assimilated, resisted, and revised for indigenous purposes. But as the above example suggests, there are rich lodes of evidence to mine. Thanks, Mike, for taking time out of your tropical luxuriating to draw this wonderful historical confluence to our attention! You can find out more about the exhibition, "Eccentric Visions: The Worlds of Luo Ping (1733–1799)", which is up through January 10th at the Metropolitan Museum of Art, by clicking here. To see the New York Review of Books article Sappol alludes to, click here. To find out more about Michael Sappol, you can check out his incredible exhibition catalog for "Dream Anatomy" by clicking here, and find out more about his book A Traffic of Dead Bodies by clicking here. Top image is by Luo Ping, a detail of his "Ghost Amusement" ca. 1766 (more details here); bottom two images show plates from Andreas Vesalius' 1543 De Humani Corporis Fabrica, sporting nearly identical poses to those in Luo Ping's "Ghost Amusement;" More on that work by clicking here. Special Alert: Tonight's Mark Dery Lecture Cancelled Due to Snow, Holiday Party to Take Its Place! Apologies for the late notice, but it could not be helped! This evening's scheduled lecturer Mark Dery--who was to be delivering a leture entitled "Satan and Santa: Separated at Birth?," as detailed in this recent post--will be unable to make it down to New York tonight, due to the predicted super-blizzard of '09. He is very very sorry to miss his panned lecture, but, please, stay tuned; the lecture will be re-planned for the post-holiday season in early January. More to come on that. As a consolation prize, however, we offer you this: The Observatory Krampus-Themed Holiday Party, inspired by our favorite Christmas character, Krampus, St. Nicholas' mischievous/evil Eastern-European sidekick (as seen above)! We had planned to begin the party at the end of Dery's lecture, but will now begin at 8:00 PM, to amuse the disgruntled masses who did not recieve this cancellation alert. The party is free of charge, and will feature live-music (Krampus-Carols!) by Ruprecht and the Birch Switches, holiday gifts, birch-switch-beatings, treats, rusty chains, lolling tongues, and, of course, booze. 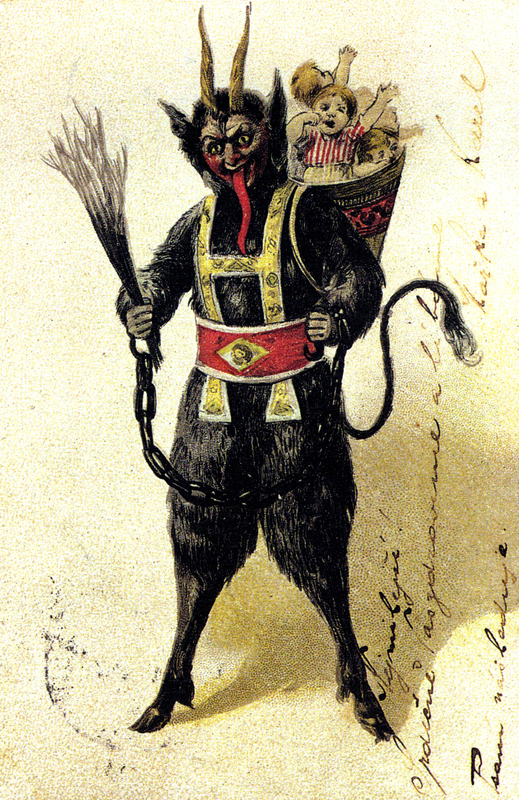 To learn more about Krampus, click here. For directions to Observatory, click here. Join Observatory on Facebook by clicking here. To see the entire upcoming Observatory schedule, click here. To get on the mailing list, click here. 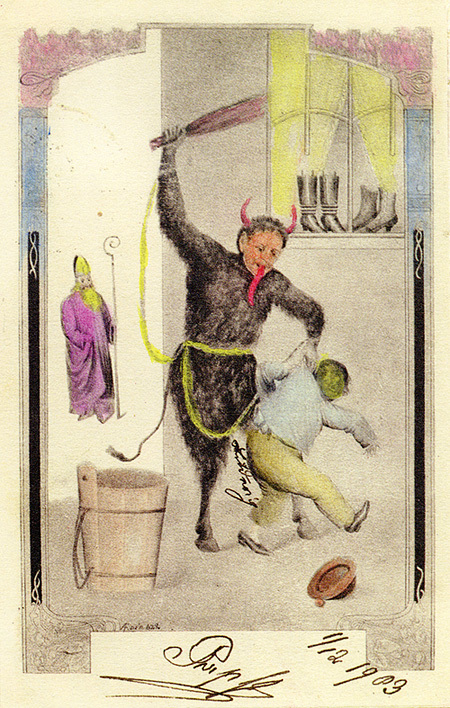 Image: Vintage Postcard of Krampus, the Anti-Claus. Reproduced under Fair Use provision of copyright law. 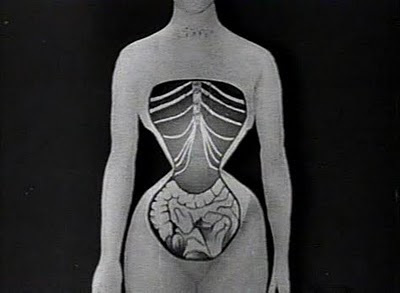 Above are some fantastic film stills from a German film called Wege Zu Kraft und Schönheit - Ein Film über moderne Körperkultur (The Way to Strength and Beauty), a film on modern body culture by Nicholas Kaufmann and Wilhelm Prager from 1925. 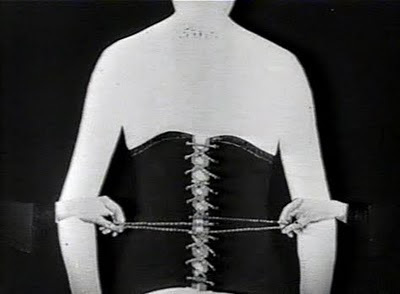 Found on the wonderful Elettrogenica blog, which captioned the images as follows: top 2: "beware the corset!" and bottom 2: "about breathing." Click here to see original post. As mentioned in a previous post, a short segment about the Morbid Anatomy Library was included as part of a "Weird New York" episode of WPIX's "Toni On! New York." I just found out (thanks, Curio Society!) that the entire episode has been posted to You Tube. You can watch the segment featuring the library above; you can watch the entire episode divided over four segements by clicking here. It has just been announced that next year's European Association of Museums for the History of Medical Sciences (EAMHMS) conference will be hosted by the Medical Museion at the University of Copenhagen. If the Museion's awesome blog Biomedicine on Display is any indication, this conference--which aims to investigate ways in which museums can respond to the challenge raised by the "molecularisation, miniaturisation...digitalisation and intangibilisation" of new medicine--will be thought-provoking, innovative, and revelatory. Full details--including information on how to submit papers, which are due at the end of February--below. This looks to be a great conference; hope to see you there! + How does physical representations of contemporary medicine in museum spaces relate to textual representations in print and digital representations on the web? For further information, see http://tinyurl.com/ylx5atx or contact Thomas Soderqvist, ths@sund.ku.dk. For practical information about travel, accommodation, etc., please contact Anni Harris, konference2010@sund.ku.dk, after 4 January 2010. If you would like further information or have any questions, please contact Thomas Soderqvist at ths@sund.ku.dk. You can visit the Medical Museion website by clicking here, and its immensely readable blog "Biomedicine on Display" by clicking here. Visit the EAMHMS website by clicking here. Information about the last awesome EAMHMS conference can be found by clicking here. Introducing the Morbid Anatomy Bookstore! Quite often, especially during the holiday season, I receive emails from Morbid Anatomy readers soliciting book recommendations for their families, friends, and loved ones. To ease this recommendation process, I have recently launched The Morbid Anatomy Bookstore, which contains all of my favorite, Morbid Anatomy-ish books, available for immediate purchase from Amazon.com. All proceeds from sales go to the purchase of additional material for The Morbid Anatomy Library, which is open to the public by appointment in Brooklyn, New York. On a related note: if any of you out there are feeling an aimless sense of philanthropy this year, perhaps you might like to contribute to the growth of the Morbid Anatomy Library! To this end, I have created a Morbid Anatomy Library Wishlist, where you can see what important books are still missing from the collection and, if so inclined, donate them to or purchase them for the library. 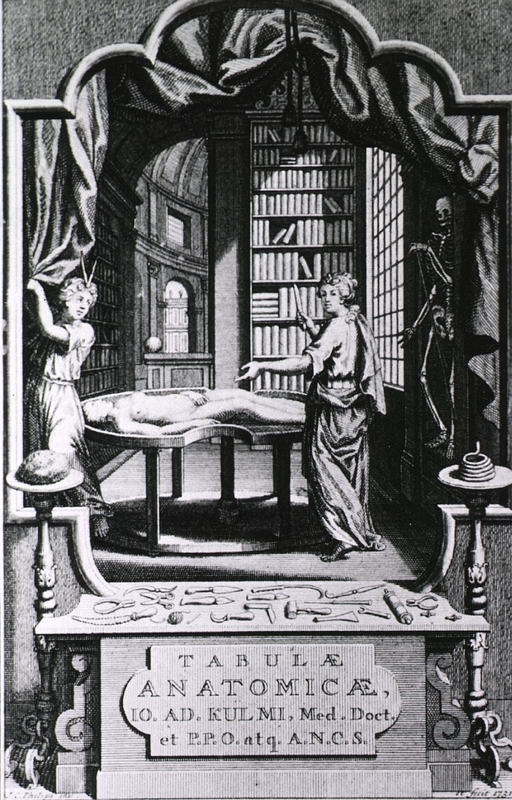 The goal of the Morbid Anatomy library is to serve researchers, artists, and the curious public as a collection of books, scholarly articles, and artifacts related to medical museums, artistic anatomy, cabinets of curiosity, collectors and collecting, memorial practices, art/science, and mortality studies, presented in an environment conducive to the contemplation of such matters. Your donations will help fill the gaps in the collection, and help the MA Library serve the community even better. You will also receive an attractive donor's card for your trouble! Also, if you desire to make donations of the artifactual kind, or any books or objects not found on this list, that's great too! You can contact us at morbidanatomy@gmail.com. Click here to visit the online Morbid Anatomy Bookstore (and be sure to page through to the end; there are 15 pages thus far!). Click here to check out the Morbid Anatomy Library wishlist. 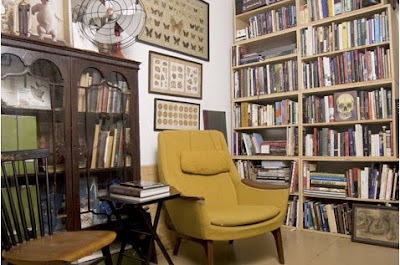 As mentioned, the Morbid Anatomy Library is open to the public by appointment; if you wish to visit the library, you can make an appointment by emailing morbidanatomy@gmail.com; You can find out more about the library by clicking here. And, if you feel that there is an important book missing from any of my lists, I would love to hear from you at the above email! This Monday, December 14th, Observatory, in conjunction with Proteotypes and Proteus Gowanus Interdisciplinary Gallery and Reading Room, will be presenting a very exciting lecture by author Wendy Walker about the infamous Road Hill House Murder of 1860, in which 15 year old Constance Kent of Somerset was accused of killing her three-year-old half-brother and stuffing his body down the privy. The story of the Road Hill Murder has many--as you will read in the description below--bizarre and enigmatic elements. It was an important and influential case that captivated the imagination of the times, inspiring the first true-crime novel (The Great Crime of 1860 by Joseph Stapleton), providing the source material for a number of literary works (Wilkie Collins’ The Moonstone and Dickens’ The Mystery of Edwin Drood), causing riots in the streets, and marking itself as "a watershed in the history of police investigation, forensic medicine, journalistic practice and and British criminal law." Author Wendy Walker--who's new book on the life and enigma of Constance Kent, Blue Fire, has just been published--will tell the whole fascinating and bizarre story--with pictures!--on Monday night. Copies of Blue Fire be available for purchase and signing. Hope to see you there! A talking tour by Wendy Walker, author of Blue Fire, a new work that reexamines the unsolved case of Constance Kent, protagonist at 15 of the Road Hill House Murder. Accused of killing her three-year-old half-brother and stuffing his body down the privy at the family estate in Wiltshire, Constance was cleared at the coroner’s inquest. In the view of many at the time, the boy had been killed by his father and his nurse, surprised in bed. Yet five years later, under the influence of a priest, Constance confessed to the crime. The “Great Crime of 1860” and the trial of Constance Kent constituted a watershed in the history of police investigation, forensic medicine, journalistic practice and and British criminal law. It caused riots in the streets and rocked the Anglican Church. It was the ancestor of the country house murder mystery and directly inspired both Wilkie Collins’ The Moonstone and Dickens’ The Mystery of Edwin Drood, as well as the first true-crime book, The Great Crime of 1860 by Joseph Stapleton. It has been novelized, dramatized, televised and filmed, and recounted from various angles, most recently by Kate Summerscale in The Suspicions of Mr Whicher (2008). The enigmatic figure at the center of this story confessed to a crime she did not commit, was condemned to death, spent twenty years in prison, and went on to a career of almost sixty years as a nurse and social activist. This talk with images will trace the three stages of her long life. Wendy Walker is a core collaborator at Proteus Gowanus and the editor of Proteotypes. Besides Blue Fire, she is the author of The Secret Service, The Sea- Rabbit, or, The Artist of Life, Stories Out of Omarie (all from Sun and Moon Press) and Knots (Aqueduct Press). Her critical fictions have appeared in Conjunctions, Parnassus, 3rd Bed, Fantastic Metropolis, the Green Integer Review and The Gertrude Stein Awards for Innovative American Poetry. To see the entire upcoming schedule, click here. To get on the mailing list, click here. For directions to Observatory, click here. Join Observatory on Facebook by clicking here. You can find out more about Wendy Walker by clicking here. Image: "Constance Kent, the murderess. "Mark Joseph Allan; Albumen silver carte-de-visite [ca. 1866]; Reproduction rights owned by the State Library of Victoria; Found on the State Library of Victoria Website. Click here to find out more about Wendy Walker's book Blue Fire. Satan and Santa: Separated at Birth? Lecture by Mark Dery (!!!) Followed by Observatory's Krampus-Themed Holiday Party! On Saturday, December 19th, cult author and cultural critic Mark Dery--who you might remember from these (1, 2, 3, 4) recent MA posts--will be gracing the halls of Observatory with his lecture "Satan and Santa: Separated at Birth? How the Lord of Misrule became a Bourgeois Tool (And Still Managed to Enrage the Religious Right)." I have seen this man speak before, and I promise you, he a riveting, engaging, challenging speaker; seriously not to be missed! For yet more incentive to trek out into the cold that evening, following Dery's lecture will be Observatory's Krampus-Themed Holiday Party, inspired by our favorite Christmas character, Krampus, St. Nicholas' mischievous Eastern-European sidekick (more on him here). The party is free of charge, and will feature live-music (Krampus-Carols!) by Ruprecht and the Birch Switches, holiday gifts, birch-switch-beatings, treats, rusty chains, lolling tongues, and, of course, booze. Come for the lecture and stay for the party, OR, come by after the lecture (9:30 ish) for the free party. Either way. Hope to see you there! Satan and Santa: Separated at Birth? Lecture, followed by an Observatory Holiday party, complete with lovely alcoholic beverages, themed snacks, and live music as performed by Brooklyn’s own Ruprecht and The Birch Switches, who will perform your favorite Krumpus Carols. Few Americans know that Santa descends from the mock king who held court at Saturnalia, the Roman festival celebrating the winter solstice. Or that he shares cultural DNA with the Lord of Misrule who presided over the yuletide Feast of Fools in the Middle Ages—lewd, blasphemous revels that gave vent to underclass hostility toward feudal lords and the all-powerful church. By the late 19th century, Christmas in Manhattan was an excuse for the rabble to go wilding from door to door in upper-class neighborhoods, demanding booze and cash from terrified householders in exchange for an off-key (and sometimes off-color) yuletide song. In desperation, Washington Irving, Clement Clarke Moore, and other members of New York’s cultural elite invented Santa Claus—and Christmas as we know it—as a means of domesticating the drunken revels of the dangerous classes. Their bourgeois myth was designed to channel lumpen unrest into a more acceptable outlet: a domestic ritual consecrated to home, hearth, and conspicuous consumption. In Satan and Santa: Separated at Birth?, Dery, a cultural critic and book author, takes a look at the Jolly Old Elf’s little-known role as poster boy for officially sanctioned eruptions of social chaos, as well as his current status as a flashpoint in “the Christmas Wars”—cultural battles between evangelicals, atheists, conservatives, and anti-consumerists over the “true” meaning of Christmas. Along the way, Dery considers New Age theories that Santa is a repressed memory of an ancient Celtic cult revolving around red-capped psychedelic mushrooms; Nazi attempts to re-imagine Christmas—a holiday consecrated to a Jewish baby, for Christ’s sake—as a pre-Christian invention of tree-worshipping German tribes, in some misty, Wagnerian past; and the suspicious similarities between Satan and Santa, connections that have fueled a cottage industry of conspiracy theories on the religious right. Mark Dery (markdery at verizon dot net) is a cultural critic whose byline has appeared in publications ranging from The New York Times Magazine to Rolling Stone to Salon to Cabinet, and whose lectures have taken him to Australia to Austria, Belgium to Brazil, Macedonia to Mexico, Germany to the Gowanus Canal. He has been a professor in the Department of Journalism at New York University, a Chancellor’s Distinguished Fellow at UC Irvine, and a Visiting Scholar at the American Academy in Rome. Dery is best known for his writings on the politics of popular culture in books such as The Pyrotechnic Insanitarium: American Culture on the Brink and Escape Velocity: Cyberculture at the End of the Century. He is widely associated with the concept of “culture jamming,” the guerrilla media criticism movement he popularized through his 1993 essay “Culture Jamming: Hacking, Slashing, and Sniping in the Empire of the Signs,” and “Afrofuturism,” a concept he introduced in his 1994 essay “Black to the Future” (included in the anthology Flame Wars: The Discourse of Cyberculture, which he edited). Our Beloved Krampus Makes the Colbert Report! Ok. As many of you know, I have long been a fan of Krampus, St. Nicholas' Eastern European, birch-switch-beating, lolling tongued, cloven-hooved, child-punishing side kick (more about him here). I learned of him and his mischevious, intriguing ways while living in Budapest, where Krampus continues to be a beloved part--and to my mind, the highlight of!--the Christmas season, joining St. Nicholas for all his public appearances, even at the local Burger King! 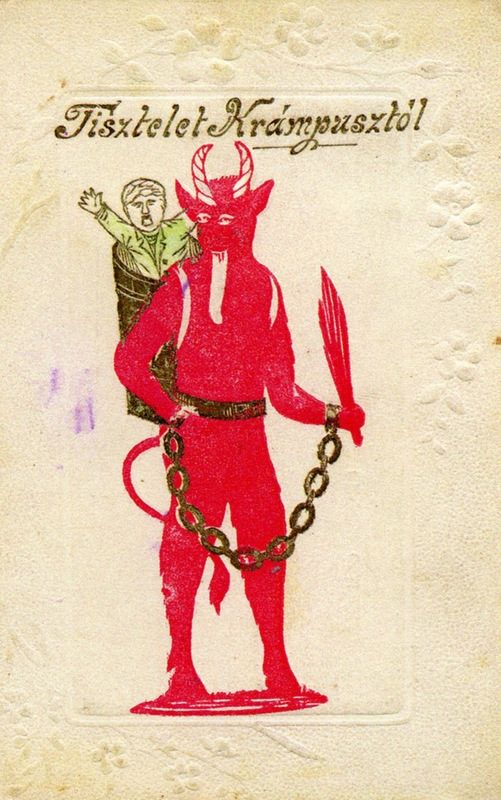 The saddest part about loving Krampus is the lack of any real recognition he earns this side of the Balkans. Well, this cultural injustice just been righted by, of all things, the Colbert Report! I kid you not. Its about time America caught up on what they're missing! Check out Krampus on the Colbert Report by clicking here. If this piques your interest, stay tuned for an upcoming announcement about the Observatory Krampus-themed Holiday party that will take place following Mark Dery's lecture on December 19th! 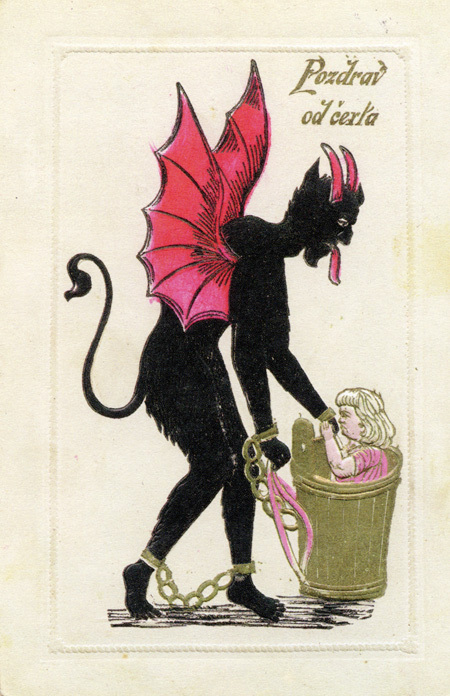 If you'd like to learn more about the illustrious and mighty Krampus, a great source is the wonderful book The Devil in Design: The Krampus Postcards. Click on image to see much larger version; image found here. Just a polite reminder. Tomorrow night. At Observatory. Lecture and artifacts presented by Robert Hicks, Director of Philadelphia's incomparable Mütter Museum! Mütter Museum Books and 2010 Mütter Calendar will be available for sale. This evening is my birthday present to myself, and I hope very much to see you there. Images of post mortem human remains are fascinating and disquieting. They amuse children at Halloween and disturb adults when on display at museums. Today’s omnipresent imagery of people doing everything at all times has not accustomed us to depictions of human mortality. The dead are speedily removed from view, and our direct contact with the dead is limited and controlled. Although mortal images can arouse empathy and may develop tolerance for a spectrum of human physical variation, other cultural voices argue for proscription and censure. In this presentation, Robert Hicks, director of the Mütter Museum, explores our dialogue with post mortem human imagery by examining its relationship to politics and ownership of the dead. He incorporates perspectives drawn from anthropology, art criticism, history, museum curatorship, and criminal justice. To see the entire upcoming schedule, click here. To get on the mailing list, click here. For directions to Observatory, click here. Join Observatory on Facebook by clicking here. 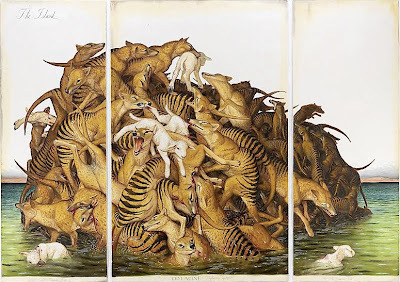 Walton Ford has long been one of my favorite artists. He is even more one of my favorite artists after hearing him speak about his work last week at the Philadelphia Academy of Natural Sciences. I appreciated Ford's large-scale, iconic, natural history illustration-inspired paintings on a whole new level after hearing his engaging accounts of their specific historical inspirations and his own artistic process. His book Pancha Tantra--which I purchased and had signed that evening--is a deluxe, over-sized, exquisite object in its own rights, fitting the work it celebrates; better yet, the back section of the book reprints many of Ford's stranger-than-fiction historical sources. Over the weekend, I paid a visit to his current exhibition at Paul Kasmin Gallery in Chelsea; Ford told me that this was his best show yet, and I heartily agree. This show closes December 23th; I encourage all that are able to check out these ambitions, enormous, inspiring works in person before the show closes. You can get full details on the exhibition here. You can purchase a copy of his book Pancha Tantra on Amazon by clicking here; You can also come visit my copy at The Morbid Anatomy Library (click here) any time. You can visit the website for the Philadelphia Academy of Natural Sciences by clicking here. And special thanks to Lord Whimsy for bringing this lecture to my attention! I just discovered that in addition to their wonderful web exhibitions and online image collection, the National Library of Medicine also has an online archive of history of medicine syllabi, which it touts as "the world's largest." The collection can be browsed by professor, title, institution, or subject and looks, after a quick perusal, to be pretty rich. A great resource for anyone--like myself--interested in teaching themselves more about the history of medicine without going to grad school. Click here to explore the syllabi collection for yourself. Found via Somatosphere. Image: "The human body and the library as sources of knowledge", frontispiece of Tabulae Anatomicae, Early 18th cent., Johann Adam Kulmus; found via the National Library of Medicine's "Images from the History of Medicine;" Larger version found on Bibliodyssey's Flickr set. To the pain in the womb. O womb, womb, womb, womb. Boxy womb, red womb, white womb, fleshy womb, bloody womb, large womb, bloated womb--demonic womb. At a recent open studio event, I met an editor for a magazine I had never heard of: Lapham's Quarterly. Interestingly, the current issue's theme was medicine, and the editor promised to send me a copy to check out. What I received has fast become my new favorite magazine. A kind of Cabinet Magazine for the history set, this digest-sized, beautifully illustrated tome is a delightful, intriguing and thought-provoking read. Each issue utilizes a sort of patchwork, magpie approach to the theme; contents include historical pieces (see epigraph above), artworks, quotations, and contemporary writings that approach the topic obliquely and with a restrained, urbane wit, resulting in an impressionistic, playful, suggestive portrait of the topic. Former issues of the magazine--described by founder Lewis H. Lapham (formerly of Harper’s Magazine) as a magazine for “people who wished they had paid more attention in school” (1)--have tackled themes such as Eros, Crimes and Punishment, and Book of Nature; the next issue will be Religion. The Medicine Issue will be on the newsstand until December 15th. I highly recommend you pick up a copy before it disappears. Truly not to be missed! You can find out more about the Lapham's Quarterly Medicine Issue--and read some of the pieces, including Lewis Lapham's brilliant introduction--by clicking here. You can find out more about the magazine in general by clicking here. Visit the magazine's blog by clicking here. Read more about the magazine in this recent New York Times story, from which the quotation above is drawn. 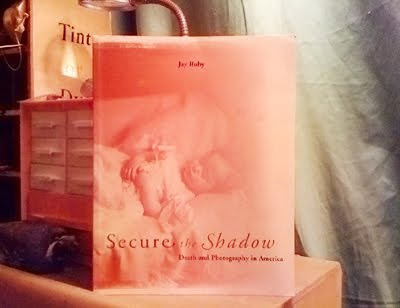 I just received the impatiently-awaited copy of Jay Ruby's Secure the Shadow: Death and Photography in America, which, in an uncharacteristically lucky moment, I won in a drawing from "The Thanatos Archive," a members-only website devoted to post-mortem and memorial photography. This book--a scholarly, lavishly illustrated work on death and photography in America--is out-of-print and quite dear to come by. Thanks so much to the wonderful Thanatos Archive for making it possible for me to add such an important and difficult-to-acquire book to the Morbid Anatomy Library special collections! Death and the way society comes to terms with it have become a major area of scholarly and popular interest, as evidenced in the work of such well-known figures as Philippe Ariès and Elisabeth Kübler Ross. Photographs and other forms of pictorial imagery play an important role in these investigations. Secure the Shadow is an original contribution that lies at the intersection of cultural anthropology and visual analysis, a field that Jay Ruby's previous writings have helped to define. It explores the photographic representation of death in the United States from 1840 to the present, focusing on the ways in which people have taken and used photographs of deceased loved ones and their funerals to mitigate the finality of death. Ruby employs newspaper accounts, advertisements, letters, photographers' account books, interviews, and other material to determine why and how photography and death became intertwined in the nineteenth century. He traces this century's struggle between America's public denial of death and a deeply felt private need to use pictures of those we love to mourn their loss. Americans take and use photographs of dead relatives and friends in spite of and not because of society's expectation about the propriety of these means. 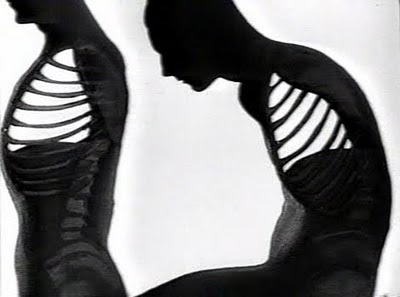 Ruby compares photographs and other pictorial media of death, founding his interpretations on the discovery of patterns in the appearance of the images and a reconstruction of the conditions of their production and utilization. A selection of Jay Ruby's photographs from Secure the Shadow are available at the Fixing Shadows website; you can see them by clicking here. You can find out more about The Thanatos Archive by clicking here. More about Secure the Shadow here. Feel free to come by and visit this fine book, and others like it, at The Morbid Anatomy Library in Brooklyn, open most days from 10-6 PM. Moulages are three dimensional teaching aids in wax... Like a plastic textbook, the moulages represented the appearance of diseases highly true to nature. In the 2nd half of the 20th century many moulage collections were neglected, forgotten or even destroyed as outdated objects for teaching. Today moulages face quite a renaissance worldwide. As visually telling objects they are used in medical exhibitions and art shows as well as in medical teaching contexts. The Berliner Medizinhistorisches Museum der Charité has just launched a new web-initiative called www.moulagen.de; the website seeks to create, via user participation, an online, accessible database of all known moulage collections, and to connect the various people who work with moulage--such as curators, restorers, artists, curators, enthusiasts and scholars--with one another and to encourage the sharing of resources, tips, and news within the community. The site will ultimately be in German and English, though the English parts of the site are somewhat limited at the moment. I was lucky to see enough to see the people behind this website--Thomas Schnalke, Isabel Atzl and Navena Widulin--present an inspiring lecture on the project at the recent "Wax Moulages as Cultural Artefacts" conference in Dresden, and I really admired their enthusiasm and vision, and the scope of what they proposed. If you have or work with a moulage collection, I urge you to visit the website and fill out their brief questionnaire (scroll down to the bottom to find both an English and German version) to participate in the building of this wonderfully conceived database project. 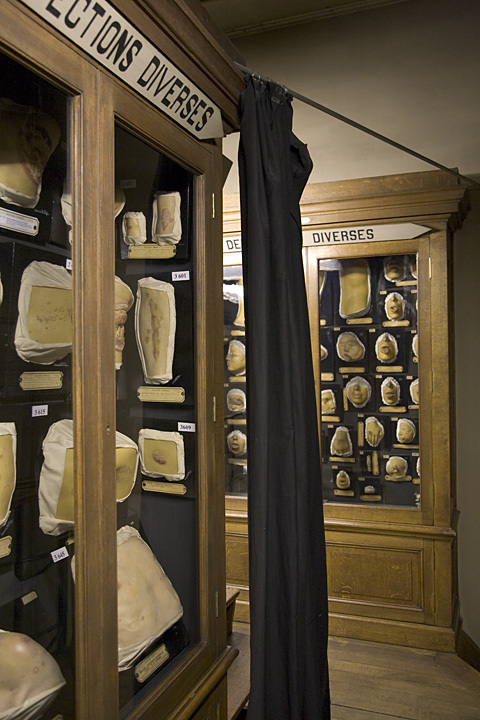 If you are fan of moulage, stay tuned; one hopes that, down the road, this website will become the definitive portal for learning about moulage and discovering the incredible moulage collections--such as le Musée des moulages de l'hôpital Saint-Louis in Paris, pictured above--that still exist around the world. Moulages are three dimensional teaching aids in wax. They were largely used between 1850 and 1950. Starting from Europe, there were soon many clinics worldwide collecting, keeping, and presenting sometimes thousands of these objects in specific collections. Like a plastic textbook, the moulages represented the appearance of diseases highly true to nature. In the 2nd half of the 20th century many moulage collections were neglected, forgotten or even destroyed as outdated objects for teaching. Today moulages face quite a renaissance worldwide. 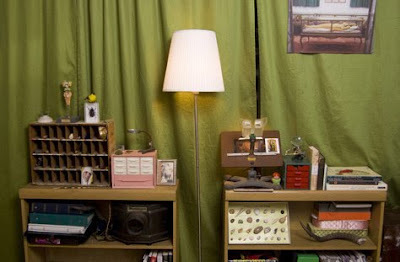 As visually telling objects they are used in medical exhibitions and art shows as well as in medical teaching contexts. There are quite a few aims of this site: It should make more information on moulages and the art of moulaging available, plus it wants to introduce the interested audience to various specific collections. In addition, all current activities, such as exhibitions or research projects connected with moulages, should be listed. With indicating relevant literature and links we want to encourage others to deepen their interest in and work on and with moulages. If you want to register your moulage collection in this portal, please go to our website www.moulagen.de, download and fill in the questionnaire and send it back to us via E-mail. Thank you very much for your contribution! Moulagen sind ursprünglich medizinische Lehrmittel, deren Nutzung vor allem zwischen 1850 und 1950 weit verbreitet war. Deutschland- und europaweit verfügten viele Kliniken über große Sammlungen mit mehreren tausend Moulagen, die wie ein Lehrbuch Krankheitszeichen naturgetreu darstellten. In der 2. Hälfte, des 20. Jahrhunderts gerieten viele Sammlungen in Vergessenheit oder wurden als unzeitgemäße Lehrobjekte zerstört. Heute erleben Moulagen eine große Renaissance, werden als anschauliche Objekte in medizinische und künstlerische Ausstellungen integriert, wieder als Lehrmittel eingesetzt oder gar neu angefertigt. Ziel dieser Seite ist es zum einen, Informationen zu Moulagen zu vermitteln und zum anderen einzelne Sammlungen vorzustellen. Außerdem sollen aktuelle Projekte wie Ausstellungen oder Forschungsarbeiten vorgestellt werden, in denen Moulagen eine Rolle spielen, sowie Literaturhinweise und Links eine weitere Beschäftigung mit Moulagen anregen. Sollten Sie eine Aufnahme ihrer Moulagensammlung in dieses Portal anstreben, füllen Sie bitte den Fragebogen aus und senden ihn via E-mail zurück. Herzlichen Dank für Ihre Mühe! You can visit the www.moulagen.de website by clicking here. Photo is from one of my favorite moulage museums in the world, the incredible Musée des moulages de l'hôpital Saint-Louis of Paris, taken on my first visit to the museum earlier this year. Click here to visit the museum website. Just a quick reminder: This Sunday, December 6th Morbid Anatomy will be presenting a very exciting lecture at Observatory: "The Dissection Room Photo: A Lost Genre of Medical Portraiture," by James Edmsonson, co-author of the critically-acclaimed book Dissection: Photographs of a Rite of Passage in American Medicine 1880-1930. Copies of Dissection will be available for sale and signing; Mütter Museum Books and the Mütter 2010 Calendar will also be available for sale. Hope very much to see you there! The Dissection Room Photo: A Lost Genre of Medical Portraiture. This illustrated lecture by James Edmonson, based on research and photographs presented in his critically acclaimed (Amazon top 10 science books of the year, featured in New York Times, New York Times Book Review, Slate, NPR All Things Considered, NPR Science Friday) Dissection: Photographs of a Rite of Passage in American Medicine 1880-1930, will explicate and contextualize an under-seen genre of the American photographic tradition: photographs taken of human dissections by medical students. This book, with more than 100 rare historic photos, will be available for sale and signing at the event, along with other Blast Books publications such as the 2010 Mütter Museum Calendar and books The Mütter Museum, and Mütter Museum Historic Medical Photographs. James (Jim) M. Edmonson is Chief Curator of the Dittrick Medical History Center and Museum of Case Western Reserve University. Jim is a historian of technology who always wanted to be a curator and by a quirk of fate ended up in a medical museum, the Dittrick Museum of Medical History in Cleveland, Ohio. Recent publications include American Surgical Instruments (1997) and Dissection: Photographs of a Rite of Passage in American Medicine, 1880-1930 (Blast Books, 2009). Jim has also recently opened a major permanent exhibition at the Dittrick, “Virtue, Vice, and Contraband: A History of Contraception in America,” and is working on a companion illustrated history of contraception in book form. In the medical museum field Jim has been past president of the Medical Museums Association and serves as Secretary General of the European Association of Museums of the History of Medical Sciences. He has been a consultant to the Warren Anatomical Museum of Harvard University, the New York Academy of Medicine, the Mutter Museum, and the Waring Historical Library. Featuring 138 rare, historic photographs, Dissection is a “landmark book” (Ruth Richardson) that reveals a startling piece of American history, the rite of passage into the mysteries of medicine captured in photography. From the advent of photography in the nineteenth century and into the twentieth century, medical students, often in secrecy, took photographs of themselves with the cadavers that they dissected: their first patients. The photographs were made in a variety of forms, from proud class portraits to staged dark-humor scenes, from personal documentation to images reproduced on postcards sent in the mail. Poignant, strange, disturbing, and humorous, they are all compelling. These photographs were made at a time when Victorian societal taboos against intimate knowledge of the human body were uneasily set aside for medical students in pursuit of knowledge that could be gained only in the dissecting room. "Dissection," writes Mary Roach, “documents—in archival photographs and informed, approachable prose—a heretofore almost entirely unknown genre, the dissection photograph.” “Without looking,” writes John Harley Warner, “we cannot see an uncomfortable past and begin to understand the legacies that American doctors and patients live with today.” That uncomfortable past saw the gradual passing of state laws, from 1831 to 1947, to govern the awkward business of cadaver supply—ever inadequate—bringing an end to reliance on professional “resurrectionists,” grave robbing, and dissection as an extended punishment for murder and as a consequence of poverty. As James Edmonson notes, “Unsettling though these images may be, they are a thread connecting us to the shared experience among medical professionals over generations. . . . As medical schools explore alternatives to human dissection, this rite of passage may disappear.” Together, the remarkable archival photographs and illuminating essays in Dissection present the astonishing social realities of the pursuit of medical knowledge in nineteenth- and early-twentieth-century America. More exciting events to come, including a presentation by Robert Hicks, Mütter Museum director (with artificats!) on Thursday, December 10th and a lecture by Mark Dery followed by a Krampus-themed Holiday Party on Saturday, December 19th. To see the entire upcoming schedule, click here. To get on the mailing list, click here. For directions to Observatory, click here. 1917 Anatomical Pig Interactive Fold-Out! I just happened upon an ingenious, manipulatable Flash animation of an anatomical fold-out pig, sourced from the frontispiece of the 1917 publication Bacon and Hams by George J. Nicholls. Click here to experience the pig in its many states--muscular, skeletal, circulatory--and click on the numbers to learn some pig anatomy. There are also some hidden fetuses if you have the patience to click around enough. God bless the internet! Found via the French Culinary Institutes's "Cooking Issues Blog," which also features a few more memorable images; click here to see them all, and find out more about the overlooked classic Bacon and Hams. Just a quick reminder: tomorrow night at Observatory, former American Museum of Natural History Artist in Residence Justine Cooper will give a presentation about her new body of work; full details below. 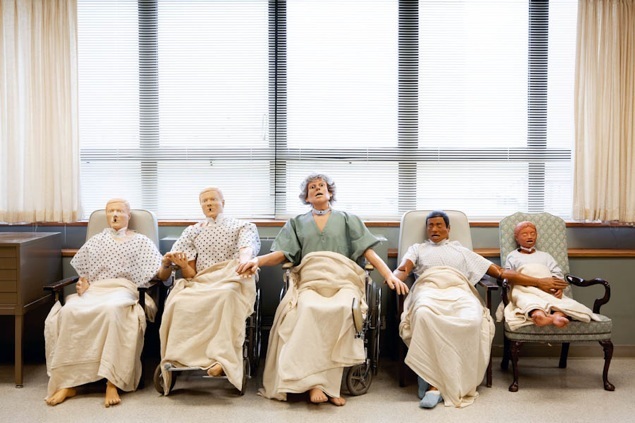 The exploding field of medical simulation inspired Justine Cooper’s Living in Sim project. Her mixed-reality artwork includes a website, online social media, photography, video and installation to explore the complexities present in the current health care environment and online social media. The project is an outcome of her artist-in-residency at the Center for Medical Simulation in Cambridge, MA from 2008-2009 along with visits to many East Coast simulation centers. Cooper will be showing images she has taken in her journeys through many of these medical simulation centers, including images of simulations in progress, the sites where medical simulation is being utilized, mannequins she has met along the way and the characters she created for them beyond their roles as patient simulators. Bio: Sydney born, New York based artist Justine Cooper investigates the intersections between culture, science and medicine. She has been artist-in-residence at the American Museum of Natural History in New York and the Australian Key Center for Microscopy and Microanalysis. She is best known for creating the (fictional) lifestyle drug, HAVIDOL (http://havidol.com). Her work has been internationally recognized and exhibited including at The New Museum, New York; The Singapore Museum of Art; Netherlands Institute for Media Art, George Pompidou Centre, Paris; and the International Center of Photography, New York. She credits her interest in making work in science and medical institutions to the fact she grew up as the daughter of two veterinarians. As a child she lived in the back rooms of their veterinary clinic, observing and sometime assisting in examinations and surgeries. For directions to Observatory, click here. To find out more about Justine's work, click here. Looks like The Morbid Anatomy Library's going to be on the tube! A short segment about the library will be included in the upcoming "Weird New York" episode of WPIX's "Toni on! New York." The episode will air Saturday, December 5th at 7:30 PM and Sunday December 6th at 11:30 AM. More about "Toni on! New York" here. Photo by Eric Harvey Brown for Time Out New York; More here. Some more "Tragic Beauties," via Shorpy.com; the caption reads "Washington, D.C., circa 1926. 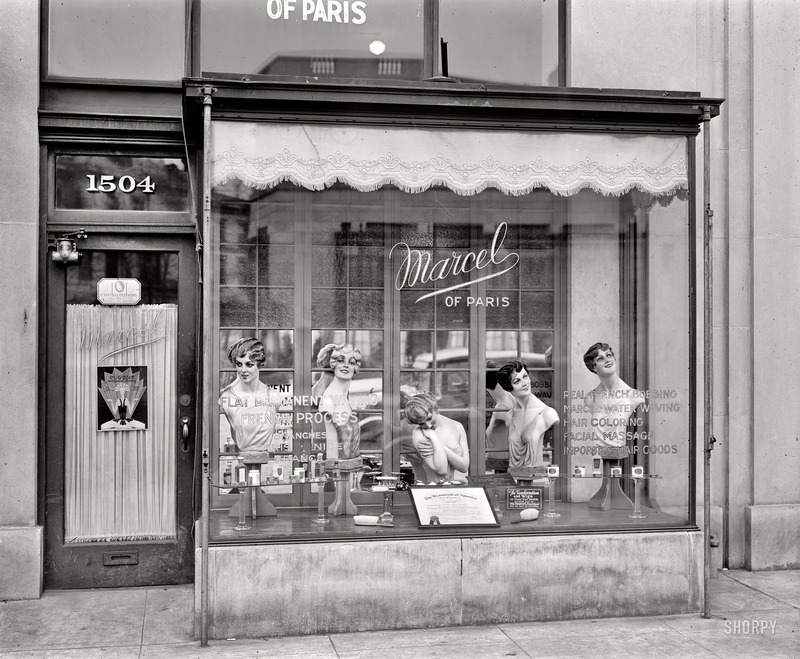 "Marcel Beauty Shop, Connecticut Avenue." Member of the 'Beauticult of America.' H&E glass negative." Click on image to see MUCH larger and more fantastic version. Thanks, Susan, for sending this along.